Four murders, a terror plot, two state police forces, multiple crack teams, numerous suspects and a diary that connects them all. This diary, recovered from the Pune residence of Amol Kale, a former Hindu Janajagruti Samiti convenor and an accused in the September 2017 murder of journalist Gauri Lankesh, contained coded entries and numbers, which, investigators claim, has brought them close to cracking the 2013 murder of rationalist Narendra Dabholkar. In the process, sleuths claim to have unearthed a terror module whose members, affiliated to fringe Hindu radical groups, were allegedly planning to carry out bomb blasts across Maharashtra. On August 10, the Maharashtra Anti Terrorism Squad (ATS) announced the arrests of three members of this module — Vaibhav Raut, 40, an alleged member of the Hindu Govansh Raksha Samiti and an alleged sympathiser of the Goa-headquartered Sanatan Sanstha; Sudhanva Gondhalekar, 39, who hails from Satara and is a member of the Shri Shivpratishthan Hindustan; and Sharad Kalaskar, 25, a follower of Hindu Janjagruti Samiti (HJS). The ATS also went on to arrest former Shiv Sena corporator Shrikant Pangarkar and another alleged member of Shri Shivpratishthan Hindustan Avinash Pawar. During interrogation, Kalaskar is said to have confessed that he and Sachin Prakashrao Andure shot Dabholkar. Following this, the CBI, which is investigating the case, arrested Andure, a member of the HJS. “Since June, Karnataka’s Special Investigation Team (SIT) probing Lankesh’s murder shared certain numbers mentioned in Kale’s diary and these were put on surveillance by the Maharashtra ATS. It was while intercepting calls exchanged between these numbers that investigators learnt of the conspiracy to carry out blasts. On August 7, ATS officers closed in on the suspects. Accordingly, raids were conducted in Nala Sopara and Vaibhav Raut and Kalaskar were detained for questioning,” said a senior Home Department official. 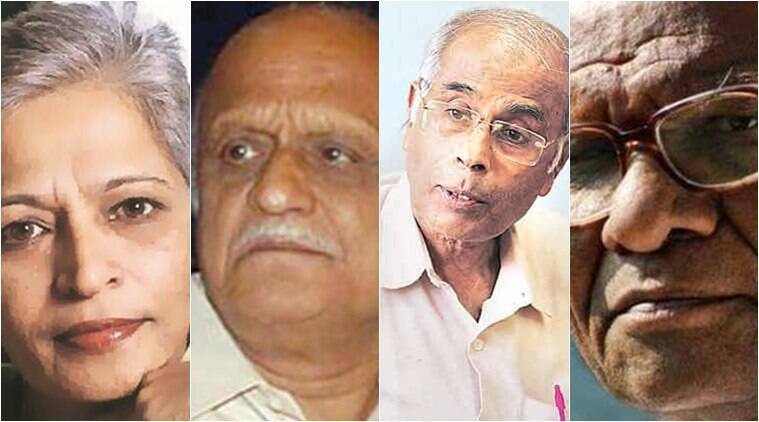 Over the last year, while probing Lankesh’s murder, the Karnataka SIT found that the journalist was shot with guns used in the murders of Dabholkar in Pune on August 20, 2013, Leftist thinker Govind Pansare in Kolhapur on February 16, 2015, and Kannada scholar M M Kalburgi in Dharwad on August 30, 2015. The investigations in the Lankesh case have also led police to the door steps of people, who on the face of it, seem to belong to fringe groups such as the Shri Shivpratishthan Hindustan but are deeply associated with overground and underground activities of the Sanatan Sanstha and its affiliate, the HJS. The Sanstha was established in 1999 by Jayant Athavale, a hypnotherapist, to promote Hindu religion. The aim of the trust is “to impart spiritual knowledge to the curious…, inculcate religious behaviour in the masses and provide personal guidance to seekers for their spiritual upliftment”. The HJS, which is a branch of the Sanstha, was set up in 2002 with the intention of establishing a “Hindu Rashtra” in India. It is also headed by Athavale. However, the Karnataka SIT has for operational reasons refrained from officially naming the Sanstha and HJS in the murders of Lankesh and others. While the six persons arrested in Maharashtra recently are members of different groups, their social media profiles show that they attended functions organised by the Sanstha and HJS. For instance, Raut was a regular at the annual conclaves held by the Sanstha in Goa and his local gau rakshak group provided logistical support to programmes organised by the Sanstha in Nala Sopara. Gondhalekar, whose role in the Lankesh murder case is being probed by the Karnataka ATS, is documented on the HJS website — with pictures — as a frequent attendee in programmes, including press conferences. According to a report and photograph on the HJS website, Gondhalekar held a press meet in September 2016 to accuse Dabholkar of financial fraud. “Pangarkar was also associated with the HJS. The Facebook profiles of Kalaskar and Andure show that they were affiliated to the HJS and they both knew Tawde. When all of this is pieced together, the probe points not only to the HJS but also Sanatan Sansthan,” explained the official. The six arrested; (clockwise from top left) Sudhanva Gondhalekar, Vaibhav Raut, Sachin Andure, Sharad Kalaskar, Shrikant Pangarkar and Avinash Pawar. The Sanstha and HJS have, in fact, tried to remove links from their websites of association with several persons recently arrested by the Karnataka SIT and authorities in Maharashtra for their alleged roles in the four murders and for reportedly planning fresh shootings and acts of terrorism. Of the 12 persons arrested by the Karnataka SIT in the Lankesh case, the most glaring association with the Sanstha is that of Amit Degwekar, 38, who claims to be a proofreader for Sanstha mouthpiece Sanatan Prabhat, but was described by then Sanstha spokesman Abhay Vartak as a promoter of the magazine. Degwekar was arrested by the Karnataka SIT on May 20, 2018, along with former HJS Pune convenor Kale and HJS sympathiser Manohar Edave on the basis of investigations that indicated that Kale alias Bhaisaab was a key player in the operations to kill Lankesh. Unlike Degwekar, the links of the others to the HJS and the Sanstha can be disputed. Kale, an engineer by profession, is being linked to all four murders and has been identified by the Karnataka SIT as the head of the Hindutva covert group. The HJS website has references to Kale as a member of the group and a convenor for the Pune region until 2009-10. Following Kale’s arrest in May, HJS spokesperson Ramesh Shinde said that Kale had not been associated with the group over the last 10 years and that he left it around 2008 for “personal reasons’’. 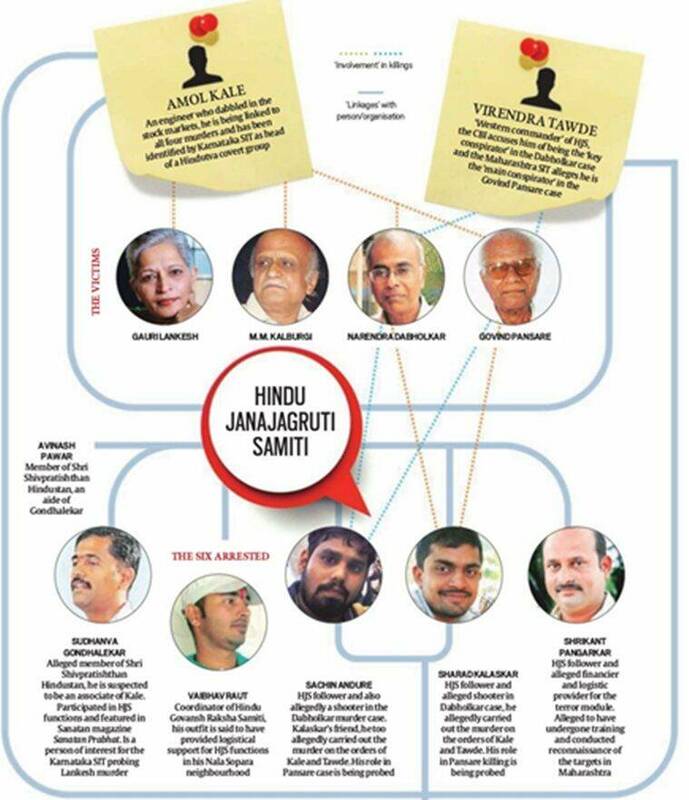 The Karnataka SIT has, however, found that Kale’s family in Pune is still closely associated with the Sanstha and HJS. His child, they say, has been designated by the Sanstha as a gifted child with a “high spirituality quotient since birth”. In 2017, Gondhalekar’s children too were similarly designated by the Sanstha as having “high spiritual quotient” though, according to spokespersons for the Sanstha and HJS, Gondhalekar is not directly linked to either of the two groups. “There are very few children who get this tag of spirituality… This suggests an association with the group,” sources in the Karnataka SIT said. Among the other 10 persons arrested for the Lankesh murder so far, Sujeet Kumar, a recruiter for the covert group, is a former HJS activist, who, the organisation claims, dissociated from the outfit around 2012. There are, however, articles and photographs on the HJS website of his participation in the organisation’s events. Similarly, the HJS website has a write-up from 2008 featuring Suresh Kumar alias Suresh H L, a man who allegedly accommodated Kale and Gondhalekar at his home in Bengaluru around the time Lankesh was murdered, at an HJS “anti-terrorism exhibition” held at a school in his hometown in Karnataka. Rajesh Bangera, 50, a government employee from Mangalore,who became an arms trainer for the covert group around 2012, was among the early trainees at arms and self-defence training camps conducted by the Sanstha in 2001-2003. He lists the Sanstha among his ‘likes’ on Facebook. Bangera’s friend Mohan Nayak, 50, who allegedly helped rent a home for the Lankesh’s shooter and three members of his support team in the Kumbalgodu area, too is associated with the HJS, according to his social media profile. The first person arrested in connection with Lankesh’s murder, K T Naveen Kumar, a resident of Maddur in Karnataka, who was accused of providing logistical support for the killing, was a leader of the Hindu Yuva Sena. Ahead of his recruitment by the covert group headed by Kale, Kumar was invited to attend the June 2017 edition of the annual All India Hindu Adhiveshan organised in Ponda by the HJS and Sanatan Sanstha. There are images on HJS’s social media accounts of Kumar at the Goa convention. Sources in the Karnataka SIT say that since 2009, when the Sanstha and Hindu Janajagruti Samiti were directly implicated in the Margao blasts, much of the subsequent covert activities were outsourced to individuals from fringe outfits like the Hindu Yuva Sena, Sri Rama Sena, Shri Shivpratishthan Hindustan and even former Shiv Sena members who worked under the guidance of former HJS activists. “Till the 2009 blast, many mainstream Hindu leaders used to attend the conclaves organised by the Sanstha and HJS. After the Sanstha was linked to the blast, the group began losing credibility and efforts were made to create a wall between the subversive activities and overground activities like the adhiveshan (national conclaves),” a source said. Investigators in Maharashtra say that while the six men recently arrested seemed to have “worked in silos”, they could be involved in multiple cases. “For instance, the five arrested were part of a module that was planning to carry out blasts in five cities in Maharashtra but one of them, Kalaskar, has confessed that he killed Dabholkar. This shows that unknown to each other, they were involved in other cases,” said a senior ATS officer on condition of anonymity. “Going by Kalaskar and Andure’s confessions, they were the shooters in the Dabholkar case and carried out the killing on the orders of Kale and Tawde. While Tawde is a leader of the HJS and is currently an accused in the CBI case probing Dabholkar’s killing, Kale has been arrested by the Karnataka SIT in connection with the murder of Lankesh. Tawde is also an accused in the Pansare murder case and there is a strong suspicion that either the shooters are the same or are known to the group. The shooters (Andure and Kalaskar) were trained by Bangera, who has been arrested in the Lankesh case and is suspected to have imparted weapons training to dozens of recruits, including the shooters in the Dabholkar and Lankesh cases,” explained an official. For now, the fate of the four murder cases hangs on the results of the forensic test that is to be conducted on the fire arm recovered from the residence of Andure’s friend in Aurangabad. If the Forensic Science Laboratory confirms that the weapon was used in the murder of Dabholkar, it could be a major breakthrough as the CBI has so far not been able to lay its hand on it. As part of the recent raids it carried out, the Maharashtra ATS claimed to have recovered a cache of arms and ammunition, including 20 crude bombs and 16 country-made pistols. There is a possibility that the guns used in the murders since 2013 are among these weapons since Gondhalekar has admitted to having collected and preserved weapons after Lankesh’s killing, sources in the Karnataka SIT said. Five year after Dabholkar’s killing, the CBI is hopeful that they might finally recover the murder weapon. “Despite having a cache of weapons, we suspect that the accused used the same set of weapons in all the murders probably because they were superstitious,” says a CBI official. In spite of the confidence displayed by investigators, questions remain. For instance, the Pune Police arrested Maharashtra-based arms suppliers Manish Nagori and Vilas Khandelwal for Dabholkar’s murder but the two were not chargesheeted for lack of evidence. Besides, the CBI and SIT suspected that Sanstha members Sarang Akolkar and Vinay Pawar were shooters in the Dabholkar case. The agencies had based this on eyewitness accounts, but have1 now named Andure and Kalaskar as shooters. As police claim that they have more or less pieced together the conspiracy behind the murders, what remains to be seen is how they work their way through this complex maze of characters and motives and whether they have a water-tight case at the end of it. Durgesh Sawant: An email sent by Sawant, former spokesperson of Sanatan Sanstha, ordering Tawde to “concentrate on Dabholkar” has been cited in the chargesheet as the ‘beginning’ of the conspiracy to kill Dabholkar. Sarang Akolkar and Vinay Pawar: Sanstha ‘seekers’, wanted since the 2009 Goa blast. Were suspected to have played an active role in the Dabholkar and Pansare murders. Were identified as the shooters in both the cases, but with Andure and Kalaskar now being named as shooters, status unclear. Rudra Patil: Sanstha ‘seeker’, wanted since 2009 Goa blast. Suspected to have played an active role in Pansare murder. Amit Degwekar: Resident of the Sanstha ashram in Ponda, Goa, he is suspected to be the link between the Sanstha and activities of a covert group headed by Amol Kale.